Daniel James Nava (born February 22, 1983) is an American professional baseball left fielder who is a free agent. He has played in Major League Baseball (MLB) for the Boston Red Sox, Tampa Bay Rays, Los Angeles Angels, Kansas City Royals, and Philadelphia Phillies. Nava is only the fourth player in MLB history to hit a grand slam in his first major league at bat and the second to do it on the first pitch. Nava was born in Redwood City, California. He played baseball at St. Francis High School in Mountain View, California and received his Psychology degree from Santa Clara University. He was 4 ft 8 in (1.42 m) and 70 pounds (32 kg) in his freshman year in high school and grew to 5 ft 5 in (1.65 m) and 150 pounds (68 kg) by his senior year. After an opportunity to walk-on to the Santa Clara University baseball team, he failed to make the team as a player and became the team equipment manager. He left Santa Clara after two years because he could no longer afford the tuition. He then enrolled in the College of San Mateo (junior college). He tried out for the baseball team on the encouragement of an old friend he happened to run into at a gym. While at the College of San Mateo, he became a Junior College All-American. Later Santa Clara wanted him back and eventually offered him a full scholarship. He hit .395 with an on-base percentage of .494 in his lone season with the Broncos, both tops in the West Coast Conference, and earned first-team All-WCC honors. He stole 15 bases without being caught, and he had more walks (31) than strikeouts (29). When Nava graduated from college, he went undrafted and signed with the Chico Outlaws of the Golden Baseball League. The Outlaws cut him after a tryout, only to bring him back a year later to fill a void. In 2007 Nava hit 12 home runs for the Outlaws, with a .371 batting average and a 1.100 OPS. Nava was named the number one independent league prospect by Baseball America in 2007. Red Sox assistant director of pro scouting, Jared Porter, recommended the Sox sign Nava from the Chico Outlaws in 2007. The Red Sox paid the Outlaws $1 for the rights to Nava, with an agreement that the Outlaws would receive an additional $1,499 if the Red Sox kept Nava after spring training. In 2008, Nava played for high Single-A Lancaster and hit .341 with 10 home runs and 59 RBI in 85 games. His on-base plus slugging percentage was .948. In 2009, he hit .339 at high Single-A Salem before being called up to Double-A Portland, where he batted .364 with four home runs and a 25-to-12 walk-to-strikeout ratio. His OPS was .991. In 2010, Nava spent two months in AAA. At that time he was quoted as saying, "I know I have the talent and the ability, and I can keep playing at the next level," he said. "If I didn't think I could, I would have been like, ‘You know what? There’s no point.’ … I definitely thought I could perform and perform well. That’s why I kept on going. Quitting’s just not much of an option for me." Nava made his Major League debut with the Boston Red Sox on June 12, 2010 at Fenway Park as the starting left fielder against the Philadelphia Phillies. He was called up to help with the team's outfield situation, with Jacoby Ellsbury and Jeremy Hermida on the disabled list and Josh Reddick optioned to the minor leagues for more playing time. Taking the advice of Red Sox radio broadcaster Joe Castiglione, who before the game told him to swing as hard as he could on the first pitch because "that's the only first pitch in the majors you'll ever see," Nava did swing at the first pitch he saw and hit a grand slam off Phillies pitcher Joe Blanton into the Red Sox bullpen. Nava is only the fourth player to have hit a grand slam in his first at-bat, joining Bill Duggleby in 1898, Jeremy Hermida in 2005 and Kevin Kouzmanoff in 2006. Nava is only the second player, after Kouzmanoff, to do so on the first pitch of his Major League career, and the first player in Major League Baseball history to achieve a grand slam on his first-ever MLB career at-bat while in interleague play. His second at-bat, an inning later, was also with the bases loaded, but he struck out, losing the opportunity to become the only player to hit a grand slam in his first two at bats. 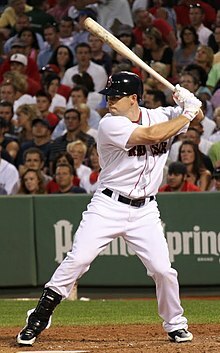 He is the tenth player in Red Sox history to hit a home run in his first plate appearance with the club, the last being Darnell McDonald on April 20, 2010 against the Texas Rangers. Creighton Gubanich is the only other player in Red Sox history to hit a grand slam for his first big league hit; however, it was not in Gubanich's first Major League at-bat. Bill LeFebvre is the only other player in Red Sox history to hit a home run on the first pitch thrown to him in the big leagues, doing so June 10, 1938. Due to his outstanding debut, Nava continued to start for the Red Sox. On June 17, he had his first three-hit game, two of those hits being doubles, against the Arizona Diamondbacks. Nava reached base safely in his first 13 MLB games. Nava was sent back to Triple-A Pawtucket on July 22, 2010 to make room for Hermida, who came off the DL. He was recalled to Boston on August 2, 2010 to replace Mike Cameron, who was placed on the DL, then optioned two days later to make room for Ellsbury. On August 17, 2010 he was again recalled after Ellsbury re-injured his ribs. Nava was designated for assignment and removed from the Red Sox' 40-man roster on May 20, 2011. He passed through waivers unclaimed and was out-righted back to the Pawtucket Red Sox. Nava was not invited to major league training camp in 2012, but was recalled to the major league in May of that year, due to the absences of Jacoby Ellsbury and Carl Crawford. Nava's debut grand slam was the only major league home run to his credit in his first 188 at bats, until May 14, 2012, when he hit a two-run home run for the Red Sox at Fenway Park against the Seattle Mariners. In 88 games played in 2012, Nava batted .243 with 6 home runs and 33 RBI. Nava hit a three-run home run which proved to be the winning margin on April 20, the first Red Sox home game after the Boston Marathon bombing earlier that week. On July 29, 2013, Nava fell victim to a controversial call at home plate in which he was ruled out by umpire Jerry Meals, who later admitted that the call was incorrect. Nava platooned with Jonny Gomes in left field throughout the Red Sox' championship season of 2013, posting career highs in games played and all offensive categories. He placed eighth in the American League in batting average (.303) and fifth (.385) in on-base percentage. With the Red Sox finishing 97-65, the team won the AL East and eventually the 2013 World Series over the St. Louis Cardinals. Despite winning the World Series the previous season, Nava batted only .136 with 2 homers and 3 RBIs in the first 17 games in 2014. He was demoted to Triple-A Pawtucket on April 23, 2014. He was recalled on May 27, 2014 after Shane Victorino went on the disabled list. Nava still failed to improve and was again demoted to Triple-A on June 1, 2014. He was again recalled on June 2, 2014. On September 14, 2014, Nava hit his second career grand slam off of Kansas City Royals pitcher Aaron Crow. On July 30, 2015, Nava was designated for assignment after struggling throughout the season with injuries and inconsistency at the plate. Nava was claimed off waivers by the Tampa Bay Rays on August 5. He made his debut with the Rays two days later, facing the New York Mets and starting in right field. Batting 7th, he went 0 for 2, before being lifted for a pinch hitter. After the season, he was designated for assignment. Nava signed a one-year deal with the Los Angeles Angels of Anaheim on December 16, 2015. After spring training ended, Nava ended up on the 15-day DL. He was activated towards the end of May and, after struggling offensively and in a platoon role, the Angels designated him for assignment in July. He would finish his tenure with the Angels hitting .235 with 1 home run in 45 games. On August 29, 2016, the Angels traded Nava to the Royals for a player to be named later. On December 12, 2016, Nava signed a minor league contract with the Philadelphia Phillies. He made the Phillies' major league roster, and in his first game as a Phillie on April 6, 2017, he homered in his first two at-bats. On February 6, 2018, Nava signed a minor league contract with the Pittsburgh Pirates. On February 28, it was announced Nava would be sidelined 10 to 12 weeks after back surgery. He was released on March 20, and signed a new minor league contract with Pittsburgh on March 23. He became a free agent on November 6, 2018. Nava's father, Don, is a fitness instructor and a coach. Nava got married in the early offseason of 2012. He and his wife, Rachel, have one daughter. From 2008 to 2010, he left a ticket at every minor league home game for ESPN sportscaster Erin Andrews. ^ "Daniel Nava Stats". Baseball Almanac. Retrieved December 3, 2012. ^ Maurer, Rainer Willi (2005). "Monetary Economics without Santa Clause - Part One: The Neoclassical Model". doi:10.2139/ssrn.645381. ISSN 1556-5068. ^ rfldumughn@yahoo.co.uk (2010-04-03). "Heard It From Hoard: The "Tall Tale" of Daniel Nava". Danhoard.mlblogs.com. Archived from the original on 2010-06-19. Retrieved 2010-06-13. ^ a b c d e f Brian MacPhersonJournal Sports Writer (2010-04-13). "Daniel Nava: From equipment manager to major-league prospect | | projo.com | The Providence Journal | Pawtucket Red Sox". projo.com. Retrieved 2010-06-13. ^ a b Ian Browne. "After long journey, Nava takes historic swing | MLB.com: News". Mlb.mlb.com. Retrieved 2010-06-13. ^ a b Andrews, Mike. "Meet Daniel Nava, the best Red Sox minor leaguer you've never heard of - Boston Red Sox Blog - ESPN Boston". Espn.go.com. Retrieved 2010-06-13. ^ "Blogs: Clubhouse Insider» Blog Archive » Stop — Nava time!". BostonHerald.com. Retrieved 2010-06-13. ^ "Full Count » The Sox' $1 investment in Nava pays off". Fullcount.weei.com. 1960-05-10. Retrieved 2010-06-13. ^ "Full Count » Nava completes long journey to majors". Fullcount.weei.com. 1960-05-10. Retrieved 2010-06-13. ^ Lee, Tony. "Daniel Nava's Long and Winding Road Leads Him to Shadows of Fenway Park's Green Monster - Boston Red Sox". NESN.com. Retrieved 2010-06-13. ^ Sullivan, Jeff. "Daniel Nava Just Hit A Grand Slam On The First Pitch Of His Big League Career". Lookout Landing. Retrieved 2010-06-13. ^ "Boston rookie Nava hits grand slam on first pitch faced". ESPN. Retrieved 13 June 2010. ^ Abraham, Peter (2010-08-02). "Cameron returns to disabled list". The Boston Globe. Retrieved 2 August 2010. ^ Red Sox Designate Daniel Nava For Assignment, MLBTradeRumors.com, May 20, 2011. ^ a b Chimelis, Ron. "Daniel Nava plans to make the most of his time with the Red Sox". masslive.com. MassLive LLC. Retrieved May 12, 2012. ^ Red Sox honor Boston Marathon bombing victims, rally past Royals, ESPN.com, April 20, 2013. ^ Hannable, Ryan (July 30, 2015). "RED SOX MOVES: DANIEL NAVA DFA'D, TOMMY LAYNE OPTIONED; JONATHAN ARO RECALLED, JEAN MACHI ACTIVATED". fullcount.weei.com. Retrieved July 30, 2015. ^ Seidman, Corey (December 12, 2016). "Phillies sign OF Daniel Nava, LHP Sean Burnett to minor-league contracts". csnphilly.com. Retrieved December 24, 2016. ^ Tannenwald, Jonathan (April 6, 2017). "Phillies' Daniel Nava hits home runs in consecutive at-bats". Philly.com. Retrieved April 6, 2017. ^ Todd, Jeff (February 6, 2018). "Pirates To Sign Daniel Nava". MLB Trade Rumors. Retrieved February 6, 2018. ^ Polishuk, Mark (March 20, 2018). "Pirates Release Daniel Nava". mlbtraderumors.com. Retrieved March 20, 2018. ^ "Pirates' Daniel Nava: Officially back with Pittsburgh". cbssports.com. March 23, 2018. Retrieved March 23, 2018. ^ Andrews, Mike. "Meet Daniel Nava, the best Red Sox minor leaguer you've never heard of - Boston Red Sox Blog - ESPN Boston". Espn.go.com. Retrieved 2010-06-13. ^ "Red Sox Minor Leaguer Waits For Erin Andrews To Accept His Ticket, And (Sigh) His Heart". Sporting News. May 21, 2010. Retrieved April 21, 2013. ^ Lauber, Scott (June 12, 2010). "Erin Andrews congratulates Daniel Nava". Boston Herald. Retrieved January 7, 2015. Wikimedia Commons has media related to Daniel Nava. This page was last edited on 21 April 2019, at 19:56 (UTC).